Outdoor inflatable movie screen is an inflatable framework with an attached projection screen. 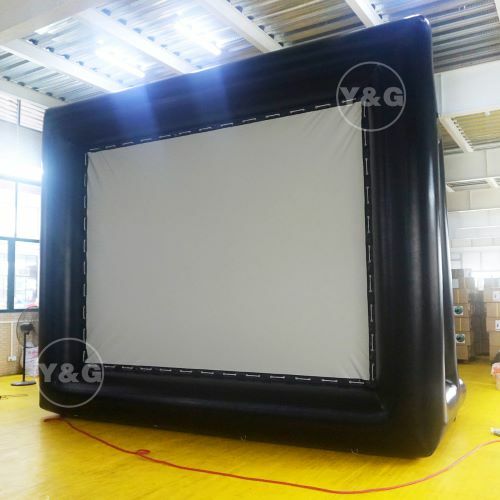 Inflatable screens are used for outdoor movies, Company annual meeting，drive-in theaters ,social activities, film festivals, and other events requiring outdoor projection. Outdoor inflatable movie screens are becoming more popular because they are affordable and easy to install. So many people prefer an inflatable screen to a conventional metal frame movie screen, because with an inflatable movie screen, you don't have to worry about assembling metal parts, and you save money and time. Just press the button and the current, and the screen expands and keeps expanding.When you first touch an inflatable movie screen, you may think it's not robust. But the average inflatable projector screen proved surprisingly resilient and robust, and most of them came with supporting ropes that could withstand a variety of weather conditions. Of course, like a normal metal movie screen, the wind and rain can completely ruin your movie-watching experience. Most importantly, most inflatable screen models are completely waterproof, which makes cleaning and maintenance of the product quite easy.This may be why the outdoor inflatable movie screen is so popular.